Crompton Greaves (CG) has installed a transformer substation at the Amrumbank West offshore wind farm in Germany. Located 100km off the German coast in the North Sea, the wind farm consists of 80 multi-megawatt wind turbines. The Amrumbank West offshore wind farm, estimated to be operational in the last quarter of 2015, extends across 32km². CG said that the plant’s 80 technologically advanced 3.6MW turbines will have a combined capacity of 288MW, sufficient to power 300,000 households. The wind farm will displace more than 740,000t of carbon emissions yearly. Amrumbank West is a 100% subsidiary of E.ON Climate & Renewables Central Europe. CG has designed and supplied all critical high voltage power equipment to connect the 33kV and 155kV networks. The company has also provided power transformers, high and medium voltage switchgear, and protection and automation equipment. 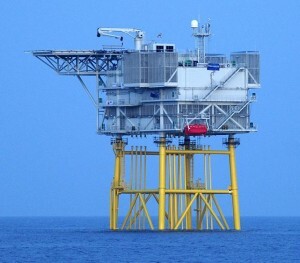 CG said that its solution includes the latest AC/AC connection link for offshore wind farms. This technology has minimal weight and low cost, while it is designed for optimal and minimal maintenance compared with traditional high voltage AC or DC solutions, the company claims. Once operational, the transformer substation will collect power produced from the 80 turbines, transform the voltage to 155kV, and transmit it to the HelWin converter station. From there, the power will be transmitted to the electricity grid operated by TenneT TSO. The wind farm’s service station on Helgoland will operate the transformer substation and will be monitored and controlled from E.ON`s Offshore Marine Coordination Center in Hamburg.